Most people enjoy curry, in fact it is supposedly the nations favourite meal so what better recipe to serve your family for their dinner than a turkey curry? This particular recipe is packed with good wholesome vegetables and could easily give your family their five a day portions for their dinner. Turkey is still a reasonably priced meat. No longer thought of as just for Christmas it crops up in lots of recipes and is low in fat as well as making a tasty dinner. This recipe uses a turkey drumstick, which is most probably the cheapest part of the bird. Cooked slowly it provides enough meat for the recipe and is surprisingly tasty. 200g mushrooms, cleaned and chopped. 2 heaped tablespoons of medium curry powder. 1 courgette, halved lengthways and sliced. Flour or chicken gravy granules to thicken. Put the turkey drumstick into a baking tin and place on the middle shelf in the oven for one hour. Place the oil into a large pan adding the chopped onion. Cook on a medium heat until the onion is soft and slightly transparent. Add the carrots, peppers and garlic, and continue to cook until they are slightly soft. At the same time place the lentils into a pan with one pint of water and simmer until soft. Add the tin of chopped tomatoes plus some water if the vegetable mix is not covered.Crumble one stock cube into the curry and leave to simmer until the turkey is cooked through adding the lentils when they are ready. Remove the cooked turkey drumstick from the oven and remove the skin. Cut off the turkey meat making sure you avoid the tendons. The meat should fall from the bone if it is cooked through. Add this to the curry mix and continue simmering for 15 minutes. Add the courgettes, peas and mushrooms plus more liquid if needed. 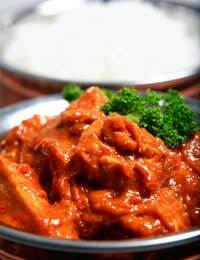 This delicious turkey curry can be served with rice or even tastier are spicy new potatoes. This is a medium hot curry so if you prefer your curry hotter then add more curry powder or purchase a hotter brand. A warm naan bread is also a favourite accompaniment to a curry as it will soak up any gravy or sauce. You can replace the turkey drumstick with diced turkey meat but try to use the brown meat as it has loads more flavour and will not become swamped by the curry taste. If using diced meat add it at the same time as the onion and brown before adding any of the other vegetables.